"No great trail was ever blazed without hardship...and you gotta fight! That's life..and when you stop fightin', that's death." In 1929, actor Raoul Walsh came across a script for an ambitious Western tentatively titled The Oregon Trail for his next project at Fox. In the meantime, the Brooklyn-born performer needed to complete work on his current film, In Old Arizona, an early talkie where he handled double duties as director and star. Tragedy struck during the shoot when Walsh was involved in an automobile accident caused when a jackrabbit crashed through the windshield of his car, causing him to lose an eye. In the spirit of a typical New Yorker, Walsh got right back to helming the feature, with Warner Baxter inheriting his role as the Cisco Kid, in a performance that would earn the last-minute substitute the Best Actor honors at the 1930 Academy� Awards. So, while Walsh's performing days might have been over, his disability certainly didn't hinder his creative abilities as the now full-time director became one of Hollywood's most in-demand shot-callers. Among his credits were genuine classics including High Sierra, They Drive By Night and White Heat. Walsh also had a knack for spotting talent, and courage to take chances on actors whom other directors or casting personnel didn't "get." One case in point involved Marion Morrison, a young hopeful who had appeared in a number of films as an extra, mainly for Fox Studios. Although never featured in a leading role, his charisma and confidence inspired future legendary director John Ford to suggest Walsh check this kid out. Morrison got the gig, but the young actor was understandably uneasy at the prospect of carrying the picture. Walsh settled his nerves by countering, "All you gotta do is sit good on a horse and point." One hurdle remained, though. Since the name Marion Morrison sounded more like a flapper in a Busby Berkeley musical, a change of moniker was needed. Although his nickname Duke made the short list of possibilities, Fox production head Winfield Sheehan wanted a simple, less gimmicky name to fit snugly on a marquee. With a little historical inspiration courtesy of American General "Mad" Anthony Wayne and perhaps that kindly director that thrust the spotlight on the former USC football player in the first place, John Wayne was ready to "saddle up." Trail opens in the midst of the pioneer revolution as a group of settlers are preparing for a long, arduous journey out west needing all the help they can get. In rides Breck Coleman (Wayne), a familiar face to some of the pack from past encounters, including Zeke (Tully Marshall) and Bascom (Frederick Burton). At first, the young cowpoke turns down an offer to play trail scout in order to continue searching for the man who murdered a close friend, but a fateful run-in with the wagon train's wickedly ornery boss, Red Flack (Tyrone Power) arouses his suspicions, as does Lopez (Charles Steven), a sneaky henchman. Breck steps into the driver's seat of a quest that will test the resolve of all involved as high cliffs, deep canyons, rough trails and more treacherous hurdles lie ahead. When not tackling such obstacles, Breck continues his attempts to win the heart of Ruth Cameron (Marguerite Churchill), a young pioneer with whom he got off on the wrong foot. Coleman's got competition for her hand in the form of Bill Thorpe (Ian Keith), a mustachioed outlaw Flack let tag along in hopes that he will do away with the scout, unless the elements (including intense heat, raging rivers and driving rain) do him in first. 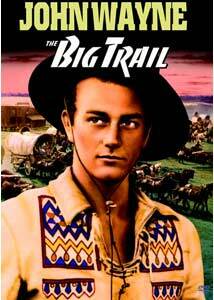 In spite of its age and primitive look, The Big Trail is a prime example of early filmmaking at its most daring. Almost completely shot on location with little or no post production tweaking, Walsh's sweeping visuals gives one the feeling of witnessing a Time-Life book on the Old West coming to life. Some of the film's strongest, most memorable sequences occur when the director dispenses with the sometimes inane dialogue, letting the pictures do all the talking, particularly in a stunning sequence where the settlers risk their lives lowering a wagon from a steep cliff with disastrous results (an unplanned moment Walsh opted to keep in the film). Also worthy of note is the tremendous amount of authenticity and detail from costuming to the use of actual Indians in speaking roles. In other words, there's not a feeling of Hollywood artificiality; this is a true western in every sense of the word. How does the Duke fare in his first at bat? Surprisingly well, as Wayne displays a confidence and ease that some actors take years to achieve. Still, he doesn't escape groan-worthy moments courtesy of a shaky script, particularly as he heads toward the homestretch of a scene with Churchill that awkwardly mixes nature talk and romantic yearning. Despite occasional missteps, the first time lead player actually fares better than most of his more experienced co-stars, like former silent screen star Tyrone Power, whose cackling wagon boss makes him come across like Captain Kidd in chaps. Churchill is all but wasted with a role consisting mainly of mean looks and disgusted tirades triggered by Breck's unintentional ineptitude. In fairness, film acting (and writing to a certain extent) in this era was still at an evolutionary stage, with many performers finding it difficult to adjust to the intimacy of the camera. Such factors make Wayne's debut even more impressive, especially in the way his performance gets stronger in the second half. During a pivotal moment when the pioneers must face bitter cold and driving snow, the actor accomplishes his first truly classic movie moment in a dialogue-heavy scene in which he admonishes his wagoners to stay strong and tough. Raw though it is, one can see glimmers of the greatness Wayne would achieve in succeeding years. With high hopes during pre-production, Fox wanted the film photographed in its newfangled "Grandeur" format (or what we now know as 2:35 widescreen). Not forgetting the smaller theaters unable to meet the screening requirements, every scene in the film was done twice to comprise an alternate version for distribution to more traditional movie houses. Wait, there's more: French and German versions were also shot simultaneously (with mostly different casts) for those burgeoning markets. Despite all the money, hoopla and great reviews showered upon it (including a triumphant premiere screening that brought the audience to its feet), The Big Trail bombed big time. Years would pass before another Western of this magnitude was attempted; two decades before Hollywood had the courage to attempt another go at widescreen technology. For John Wayne, nine years of B-movie purgatory would pass. Coming to the Duke's rescue a second time was none other than a more established (and now very close friend) John Ford. who cast him as Ringo in the legendary Stagecoach, the 1939 Western that catapulted the genre back to artistic respectability, sending Wayne on his own Big Trail toward legendary status as the world's most beloved cowboy. Image Transfer Review: As noted above, Fox ponied up the dough to have The Big Trail filmed in both full-screen and widescreen formats. In a puzzling move to some, the studio opted to present the former for its initial DVD incarnation. On one hand, it's an understandable move since the flat version is the one most familiar to audiences (most theaters in the early 1930s weren't equipped to showcase a widescreen format), but a double-disc release containing both renditions would have made everyone happy. But for now, what remains is a mixed bag. Given the era and conditions under which the film was created, I knew better than to expect Metropolis-style restoration revelations, but the inconsistent picture quality frustrates. At times, the film defies its vintage with razor sharp imagery only to have the next scene appear as if it was taken from a print two generations down. Flickering, stray lines and missing frames pop up occasionally, which may enhance or further hinder one's opinion of the transfer depending on personal tolerance for such anomalies. To me, it was like watching an above-average television print, yet I couldn't help thinking, this could be better (especially since the widescreen version is in reportedly superior condition). Audio Transfer Review: In spite of an admirable clean-up job with almost all traces of removable crackling, pops and hisses eliminated as much as possible, the antiqued soundtrack is extremely tinny with practically no low end. Although one of the two supplied audio tracks is listed as stereo, I detected no separation, but it does sound a tad bit better equalized than its mono counterpart. Extras Review: Save for trailers spotlighting other Duke roundups, dry as a desert, Pilgrim. Hopefully in the future, Fox will put out a double-disc set collecting both editions of The Big Trail (perhaps in 2007 to commemorate the 100th anniversary of Wayne's birth? ), but don't let my conflicted thoughts on the inconsistent transfer prevent you from checking out one of the finest films from Hollywood's early days. Although some may bemoan the episodic nature of the story, awkward attempts at humor and lack of gunplay, Walsh's amazing visuals and a chance to witness the big league debut of an actor that defined the first era of the Western is worth the price of admission.